Fabric: brushed cotton from Fashionista Fabrics (sold out now,) silk organza underlining from Dharma Trading. The sizing was a little strange. I normally wear an 8 on the top and 10 on the bottom in Vogue patterns. 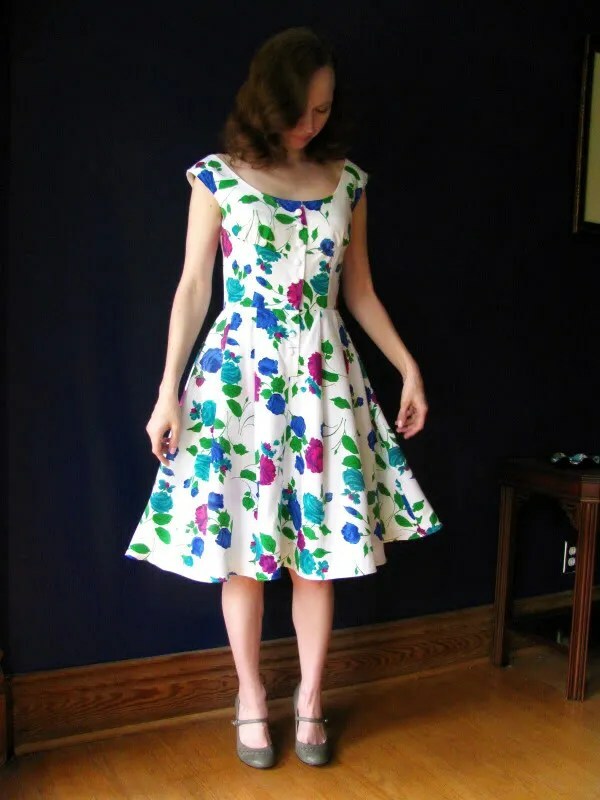 According to the finished garment measurements, a size 6 had the 34.5 inch bust I like in this style of dress (about 3 inches of ease) so I originally cut a 6 fading to an 8 at the shoulders (because I have broad shoulders) for my muslin. Well, it fit through the bust, but it was huge in the shoulders and yet way too tiny in the waist (indicating to me that a girdle was expected for the pattern, and that it hadn’t been updated that much.) So in the final dress I cut a straight 6 in the shoulders and bust, and faded to an 8 in the waist. I was still worried that it would be small in the waist, so I gave it almost an extra inch when sewing the side seams. Probably the 8 would have fit, but it was hard to tell, and I’d rather have a little too much room than not enough in the waist – I hate to feel strangled, and that way I can wear it when I sing (ever notice how opera singers wear a lot of empire waist dresses? There is a reason for that… I have massive expansion powers through my lower ribcage.) The shoulders are still a bit wide, but I’m going to sew some bra strap holders in, which I think will fix the problem. The back of the dress is pretty low – I had to buy a special doohicky to lower my back bra band or it would show. Also, notice that my hair gets redder by the day, I swear… I am thinking of dying it dark auburn. I underlined the entire dress in silk organza – I bought a 13 yard bolt from dharma trading. It was a good choice – on its own this fabric is a bit limp and slightly sheer (I think it might be sheeting) and with the organza is stands nicely without a a crinoline. I made self fabric buttons, because I am obsessed with them right now. The hem was shortened by 7 inches, and then I made a narrow machine hem (life is too short to hand hem circle skirts.) Overall I am very pleased – except for the underlining, the dress was very easy to construct. I did not do the bound buttonholes, and I topstitched the placket bottom down, but other than that I followed the directions pretty closely, and they were excellent. I would highly recommend this pattern, but watch out for the shoulder width, and measure your waist! It’s just gorgeous … don’t you feel so girlie in it? I love fabric covered matching buttons, too. Nice job! Wow, it’s simply stunning! I’m always impressed by the FOs you churn out, but this is one of my favorites. Wow! That is absolutely stunning! 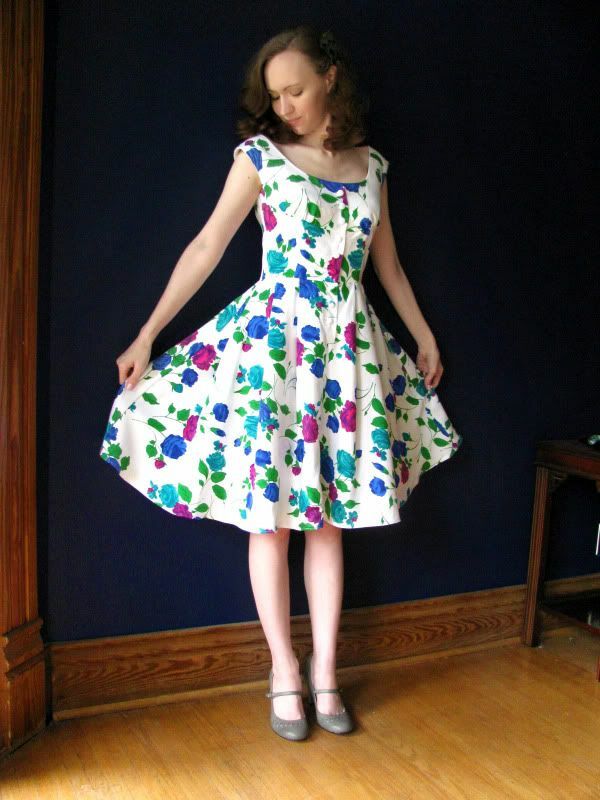 I have seen some great versions of this dress and I really want to make it for our next summer. Gorgeous! Absolutely charming – It is just so perfect for a wedding! Gorgeous! The skirt hangs beautifully, and I love the back view too! It is a lovely dress, but let’s talk about the shoes! What are they? Thanks! They are by Mia, and I just bought them last week at Macy’s. I love them – they are very comfortable and weren’t expensive at all! It’s gorgeous! Makes me take a second look at that pattern. I’m sure it will be a lot of fun to wear to the wedding. I have always loved that pattern and your version makes me love it even more! Simply stunning. That dress is absolutely beautiful!!!!! I love the fabric. Don’t do anything to your hair—I love it red. I am trying to get mine redder. So, so cute! That turned out beautifully, good choice of fabric and all! oh this is so lovely, so betty draper. i love the fabric choice, what is brushed cotton? I love the dress…but I really LOVE the shoes! This dress is gorgeous! I love the print. Your dress is so pretty and girly and perfect for a summer wedding. The style is one of my favorites. Now you have to knit a shawl to go with it, right?! awesome dress! but i have a totally unrelated question: how do you get those awesome waves and curls in your hair? do you use curlers or rag tie them at night? do tell! it’s so cute and i want to try it too! Stunning! I particularly love the back. So elegant. Oh, that is so pretty! I would love to wear a dress like that everyday. Oh..it’s so pretty! I love the low cut back! Have you tried cutting with serrated scissors? I find them very helpful when cutting sheers and things like Bemberg, as they stop the fabric from shifting as you cut. Hi. I’m back. I just went through the last few months of your blog posts. I love your blog; so I am adding you to my blog list on my sewing blog and signing up as a follower. Fabulous dress! The colors and print looks great on you! Pretty pretty! Thanks for all of the fitting tips, your hard work has paid off though as the finished dress fits beautifully. Love the back view – the low back and pleated skirt are so flattering. I love it! The colours of the fabric are delicious. I’m obsessed by covered buttons at the moment too – they make a garment feel so classy! beautiful job! it looks an excellent fit, from what i’ve read the vintage vogues AREN’T resized, just multisized, iyswim. i certainly found with v1044 that bust-waist was definitely girdle-proportioned! thanks for the idea of underlining – i may do this when i remake 1044, and i too love the shoes! Oh will you look at that – you’ve gone and made the dress of my imagination! I too have a wedding to attend and have been searching for a vintage pattern that does pretty much exactly this. 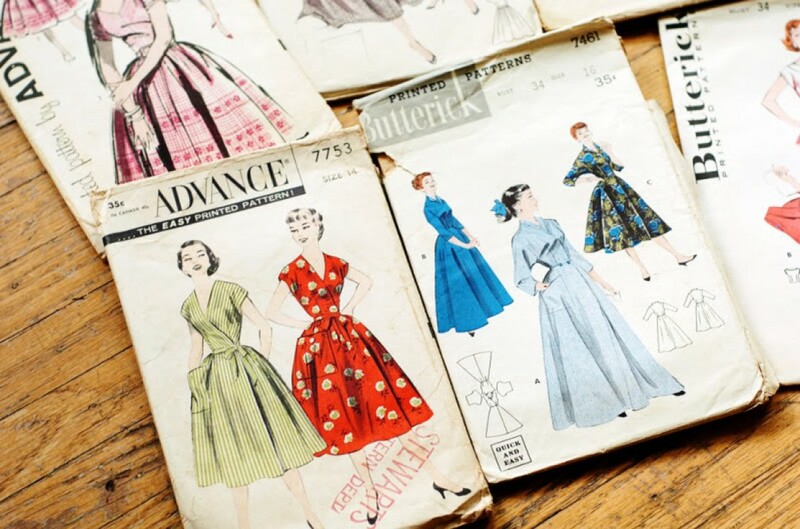 I am still hunting for the perfect pattern as I find genuine old patterns fit me better than Vogue repros – I am scared of making alterations and getting it wrong. Oooh, that’s such a pretty dress – it looks divine on you. I love your shoes, as well. How lovely! Looks wonderful on you! Lovely job!!! I think if I were wearing this dress, I would spin myself everywhere I went just so I could see the skirt twirl. Hmmm… I might have to make myself one just for this very reason, in a gorgeous flower pattern like yours, of course. Great job!!! Oh you look so fabulous in your beautiful dress, and I love your shoes. Thanks for the great and detailed review–this is one of the dresses I have in my stash and would like to make post-preggo, and it’s good to know about the bra coverage issue. This dress looks absolutely gorgeous on you (and so does your hair). I wouldn’t change a thing. The material is great and will be a wedding hit. Once again, you have outdone yourself. 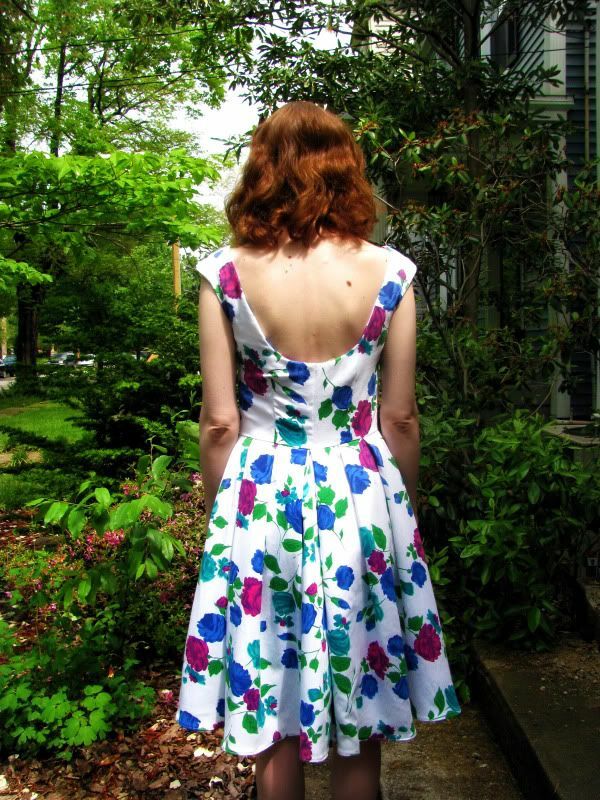 Have you considered sewing on some grips to the back of your dress? You would need at least two, one on both sides. They would hold your bra from showing and would save you the trouble of seeking extra bras. Just a bit of hand- stiching. And I love your blog. I have been a keen lurker for a good time already. Hello, nice to meet you. Beautiful results. I think we saw the inspiration dress on a Season 3 episode last night, which made me look at your pictures again. (We rent the DVD’s since we only have basic dish, so we are always behind.) It looks great on you. I LOVE it! But, I wish you would quit making me want more patterns that I hadn’t noticed before. My stash is big enough, thank you very much. I just bought that Vogue you made the royal blue dress with and now have to have this one. The styling on top is just beautiful. Great job! Oh my. What a gorgeous dress. You look absolutely fabulous in it. And the red hair? Don’t do anything about it. Red hair is beautiful! Gorgeous! You did a lovely job on it and it looks fantastic on you. I’m such a sucker for a low back dress, so I’m immediately drawn to that. Love love love. I made this same pattern but your result is much better. I agree about the shoulder width issue. Fantastic! You have inspired me to make this again! Did you fully line it? how did you do that?